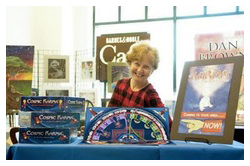 Listen in as the game creator, Linda Look, discusses the game with host Stephen Sakellarios on blogtalkradio. Interview launched May 29, 2013. "In terms of its pieces, Cosmic Karma is beautifully presented. High quality components from a small, independent publisher are a welcome treat..."
June 2012, INATS West. June 2012 exhibited in Denver at the International New Age Trade Show: the premier market in the United States designed specifically to meet the needs of New Age retailers. We are delighted to add so many new vendors to our family. October 2009, Spiel. Fall of 2009 found us in Essen, Germany participating in Spiel–the largest game exhibition open to the public in the world. We showed our prototype at the "New Author's Table" and were play-tested by some very clever young Germans, who caught a few bugs for us. February 2012, NY Toy Fair. In 2012 we launched at the NY Toy Fair-- the largest toy trade show in the Western Hemisphere with more than 1,500 manufacturers, distributors, importers and sales agents showcasing their toys, and related products. What excitement! September 2009, Market Common Art Walk. In September of 2009 we were part of the Market Common Art Walks here in sunny Myrtle Beach, SC. 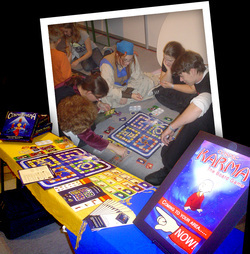 The team showed and demonstrated the game in Barnes & Noble between noon and 5pm. Prototypes were provided for play-testing, with free Starbucks drinks for testers.